Crane’s work will be on display at Vauxhall Fashion Scout in Covent Garden on September 17 during London Fashion Week, but even the designer herself can’t be certain of what she’ll be showing. “I never know exactly what something is going to turn out like in advance because the processes are still very experimental,” she says. Most of Crane’s garments are “grown” from a brew of gelatin, seaweed, and food dyes. Come London Fashion Week, rolling-rack gridlock, wrinkled garments, and last-minute fitting woes will be the least of Emily Crane's problems. 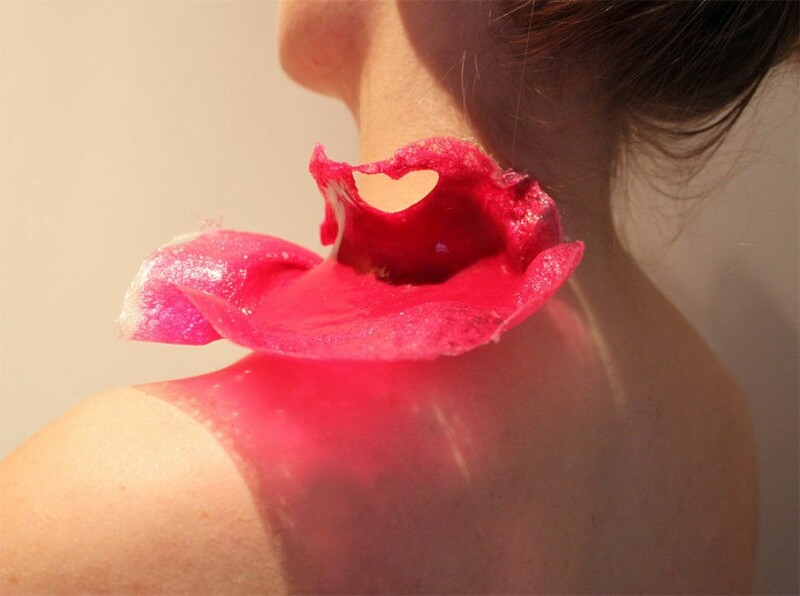 Because the Kingston University fashion student is pioneering a new strain of edible couture, she's more likely to fuss over temperature dials and vats of colored gelatin than wrestle with pins and garment tape. Even Crane's choice of mentor is less than orthodox: Instead of rapping on the doors of London's couture houses, she's been holding t�te-�-t�tes with the chefs at The Fat Duck, the three-Michelin-starred restaurant owned by avant-garde food scientist Heston Blumenthal.